What is Computer Science? Computer Science (CS) is the body of knowledge centered on the concepts of computation, information, and communication. This includes theories for understanding computing systems and methods. Computation occurs everywhere: your iPod, your car, your immune system, your brain, financial markets, ant colonies, chemical systems, DNA, quantum systems. Computer science is concerned with everything about programs; how to solve problems with them, how to build them, how to classify and analyze them and prove they are correct, how to draw pictures with them, how to get them to learn and much, much more. CS studies these systems and others using three methodologies: engineering (high performance computing, game building), scientific (artificial intelligence, machine learning) and mathematical (cryptography, complexity theory. Computer science is an exciting and rapidly growing field. Graduates with a Bachelor of Science degree in computer science can expect an entry-level annual salary of $54,000, and starting salaries for M.S. and Ph.D. graduates can go up to $100,000. Computer science will only expand as technology advances, and many wonderful opportunities exist for computer scientists, both during school and after graduation. Graduates might work within the computer industry as systems or application programmer, a systems analyst or designer, or in research. Outside the computer industry, opportunities exist in just about any job or field requiring an expert knowledge of computers and systems of hardware and software. 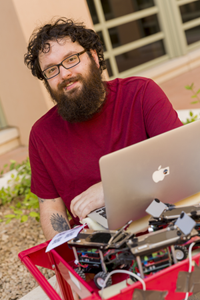 The CS undergraduate program at UNM is the only Computer Science program in the state accredited by the ABET Computing Sciences Accreditation Board. The Department prides itself on the diversity of its students and faculty, as well as its facilities and opportunities for students at all levels. 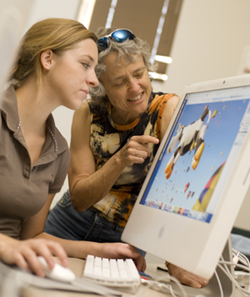 The Computer Science program at UNM has many opportunities for students to take advantage of. Some students pursue theoretical questions in great depth; others concentrate on diverse practical applications. Over the past several years, the UNM Computer Science Department has expanded opportunities for students, including a peer-tutoring program, aggressive nomination of students for awards and fellowships, and departmental scholarships. Through funding from various sources, there are scholarships available specifically for CS degree candidates, as well as opportunities to connect with research laboratories that open many doors for future careers. Students completing the program have successfully established their own businesses and research groups. The School of Engineering also offers scholarships, and many others are available through the UNM scholarship office. UNM also provides several special programs such as tutoring and counseling, as well as financial assistance for women and minority groups that traditionally have been poorly represented in engineering fields. Technology and Science Lab (ARTS Lab), an interdisciplinary center for developing creative relationships between. The Computer Science Department also maintains a wireless network in the Farris Engineering Center for faculty and students. There are two full-time staff and four part-time students providing systems support. In the UNM Computer Science Department, the faculty are committed to working with and assisting students in order to produce graduates who can be effective on the job. Research interests among the faculty include many cutting-edge topics, such as the modeling of avian influenza, computer security, artificial intelligence, high performance computing and arts and technology. In addition, the solid foundation in theory provided in the department ensures both long-term professional competence and the basis for graduate study. Members of the faculty are awarded grants from NSF, DARPA, SFI, DOE and other industry partners, and they work closely with the Santa Fe Institute, Los Alamos National Laboratory and Sandia National Laboratories in order to connect students to opportunities with New Mexico’s world-class research. For general information about the University of New Mexico, such as admission requirements, application procedures and funding opportunities, please visit the Admissions and Recruitment Services website. Click here for specific department admission information. For more information about UNM Computer Science programs, please contact the Department of Computer Science, MSC01 1130, 1 University of New Mexico, Albuquerque, NM 87131-0001, (505) 277-3112, or send an email to csinfo@cs.unm.edu.